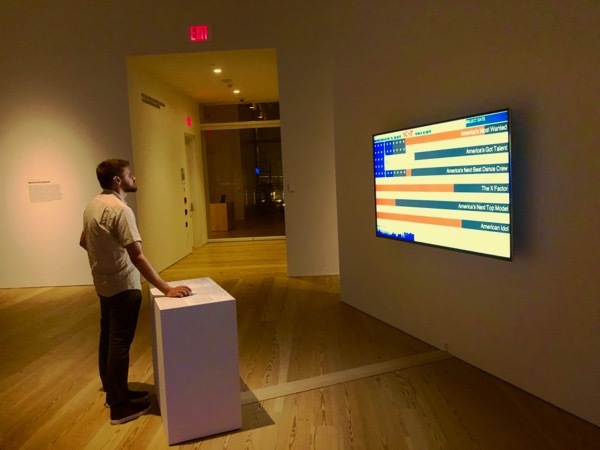 Scroller – 2001 | JONAH BRUCKER-COHEN, PH.D. Scroller – 2001 – JONAH BRUCKER-COHEN, PH.D.
A scrolling screen allows for image manipulation through physical means. 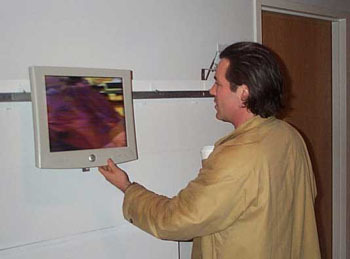 Scroller combines physical movement with on-screen image manipulation and distortion. Pushing the screen along the track changes the width of the image and blends it with the previous image captured by the camera. Nothing in the physical world is sacred and nothing in the virtual world should be either. When you use a scrollbar on a computer you are manipulating virtual data on a stationary screen. Scroller changes this dynamic by allowing people to change the image on screen by moving the screen itself. 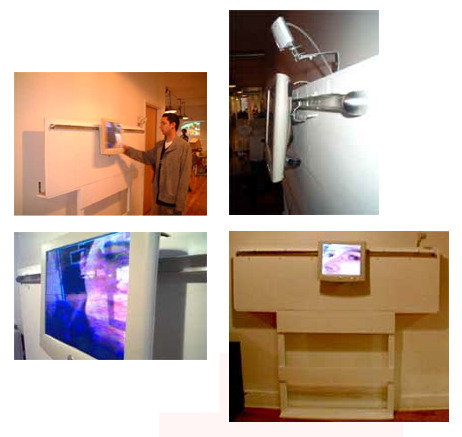 The project consists of a flat panel monitor attached to a 6 ft. long sliding closet door track. The track is affixed to a piece of wood that is mounted on a flat wall surface. Embedded in the wood are six switches that relay the screen’s position to a microcontroller. The microcontroller then sends serial information to the computer to tell it how to display the image depending on the screen’s location along the X axis. the user and takes a snapshot that is used as the manipulated image.